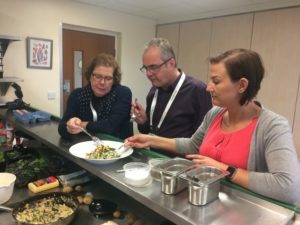 It was kitchen utensils at dawn as Freshtime in Boston welcomed cook and Belleau Kitchen blogger Dominic Franks for its first cook off challenge. 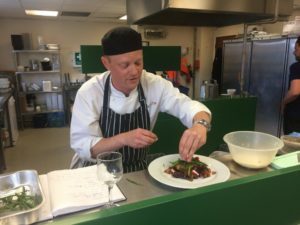 Dominic spent the afternoon with the food to go and fresh produce business’ Development Chef Luke Pearson on Monday 5th June to create a convenient two-course vegetarian meal using surprise locally sourced seasonal ingredients. Having never met before, Luke and Dominic were thrown in at the deep end with 30 minutes to assess the ingredients and brainstorm ideas for their starters and main dish – the latter of which they worked on together. The pair were given 20 minutes to prepare each of their starters, which were judged by Melvyn Prior from BBC Radio Lincolnshire, Editor of Lincolnshire Life magazine Caroline Bingham, and Freshtime’s New Product Development Manager Amanda Sumner on four main criteria – appearance, smell, taste and texture. The idea to create a meat-free meal stemmed from the rising popularity of the flexitarian diet, which involves adopting vegetarian eating habits for at least two days per week. “We are seeing that more and more consumers are making conscious choices to cut down on their meat intake to save the environment and improve the health of their body, mind and bank accounts,” said Amanda. “Therefore, for this challenge, we wanted to showcase the capabilities of fresh produce when teamed with store cupboard essentials; it can be easy to get stuck in a rut when it comes to vegetarian food, but the possibilities are endless! The brief specified that the main dish should be a convenient midweek evening meal, suitable for busy professionals and families, as well as those who aren’t confident in the kitchen. 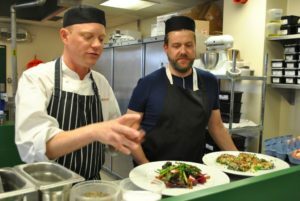 Dominic said: “As soon as we were given access to the ingredients, Luke and I both agreed we wanted to create a risotto with a twist, by using pearl barley as the main ingredient. 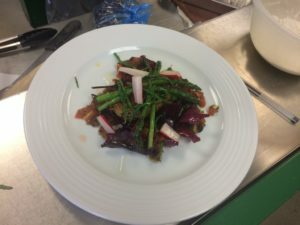 “Fresh produce and vegetarian ingredients are incredibly versatile and, although we used seasonal asparagus and samphire for this challenge, you could just as easily make it with any other combination of herbs and vegetables.